Well thought out and succinct presentation on how the use of a PEMF Mat can enhance overall health and wellness. Linden King, Actor and former NFL Linebacker for the San Diego Chargers and Oakland Raiders back in the 80's. Linden's body, while relatively fit and strong for a former NFL player, was riddled with chronic pain and range of motions issues. Watch his response after use two treatment sessions. Richard Reichle, former Professional Baseball player, Los Angeles Fireman is currently semi retired. Richard work works part time as a Nationally Certified Ski Instructor in No. California during the winter and as a college baseball coach during the Spring/Summer months. Wallace Croom, a Fitness and Boxing Trainer, has a 3-5 year history of chronic pain from injuries to shoulder, knee, and toe each treated for 10 minutes. Watch Wallace's reaction after each 10 minute session. Matt is a top Fitness Trainer at Golds Downtown Los Angeles. Matt discusses his experience after being treated three times with the Delta Pulse and its affect on a ten year old quadricep injury. At a casting audition Mariano Mendoza dislocated his left knee cap and tore the ligament on the back of the same leg. While awaiting a proper medical diagnosis, watch Mariano's progress over a a 7 day period as he treated with nothing more than the Delta Pulse. Mike Antonelli, fitness enthusiast and health advocate discusses his incredible experience after having been treated three times with the Delta Pulse. A surfing accident 10 years ago, followed by 2 car accidents, one where Mike's body was actually hit directly by the auto led him through years of ineffective physical therapy and prescription drugs. Watch and listen to how Mike life has been indelibly and positively altered by this amazing technology. Fox News Health Report with Dr. Manny Alvarez on Multi-Powered PEMF therapy. This is the world's most powerful PEMF therapy device. PEMF Whiplash neck and back pain from car accident. This person was rear ended causing whiplash and other injury's. He is an active Military personnel. We are happy to help and military personnel with low cost services. Please let us know if you are active or retired. Its our honor to serve those who have served! PEMF Foot pain of Gymnast to Avoid Surgery. Follow Story! PEMF Therapy. Body Healing Body! 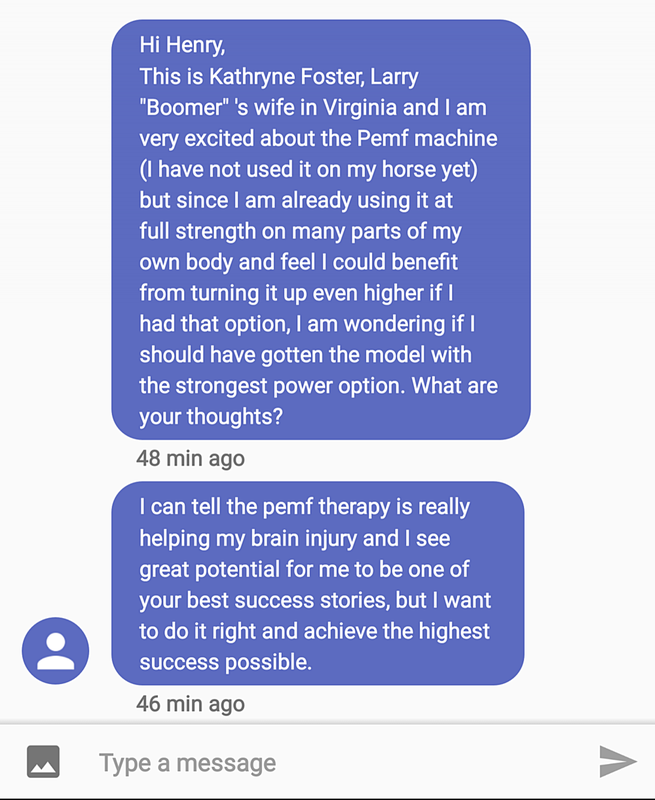 I haven't stopped smiling since having a few treatments with your PEMF therapy machine. I have had over fifteen years of extreme pain just below my right shoulder blade. I have tried two back doctors who have tried several epidurals and numerous pain injections with none or very limited success. I than decided to try chiropractic therapy which, after several treatments, gave me some relief for a very short time but than back to square one. During our visit you suggested that I try your PEMF therapy. After several treatments I must admit that I felt no improvement and even though you explained that the healing process might take several days to notice results I had my doubts. Approximately a week later I began to notice that I was able to do simple overhead tasks and my old problem was not giving me nearly the trouble that I had been experiencing for so many years. After a few more days had passed the pain was completely gone. That was five months ago and I have been completely free of pain in my upper back for five months.